Located in the heart of South Padre, this 1BR duplex is your ideal island getaway. Coastal-inspired decor, Saltillo tile floors, and beachy furnishings create an inviting and tranquil retreat. A patio and shared backyard are ideal for entertaining. Dine at your pick of restaurants within walking distance or stroll to the beach just across Gulf Boulevard and spend the afternoon soaking up the sun. An outdoor shower provides added convenience when you get home. If traveling with a larger group, consider renting the upstairs unit too for additional space. LIVING AREAS Unwind in the welcoming living room, furnished with a full-sized futon, sofa, and recliner. Watch favorite shows on the 40” flat-screen TV. KITCHEN & DINING Whip up tasty meals in the well-equipped kitchen, outfitted with sleek tile countertops and updated appliances. Convenient gadgets include a blender, toaster, and coffee maker. When it’s time to eat, share meals at the bistro table for four. BEDROOM & BATH This single-level downstairs unit sleeps four guests between the bedroom and sleeper sofa in the living room. A full bathroom is equipped with a walk-in shower and spacious vanity. Sleep soundly on a queen bed with a quilted comforter in the bedroom. OUTDOOR AREAS Relax in a hammock on the front patio or play games in the expansive backyard, which is shared with the upstairs unit. An outdoor shower makes rinsing off after a day at the beach a breeze. EXTRA AMENITIES AND DETAILS Parking is available for two vehicles (parked in tandem) in the driveway. Complimentary Wi-Fi is provided. This property is registered with the City of South Padre Island Permit No. 2015-167476. 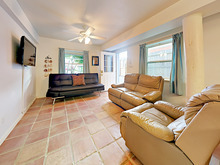 THE LOCATION Your rental is situated just 1 block from the beach on sunny South Padre Island. Lounge on the sand with a good book in hand and cool off with a dip in the Gulf of Mexico. Treat yourself to an evening on the town and check out the variety of local restaurants that line Padre Boulevard. For seafood, burgers, and craft beer, stop by Padre Island Brewing Company, a popular gastropub just a half mile from your door.